Sources have told ESPN NFL Insider Adam Schefter, that former Jets head coach Rex Ryan is about to sign a five-year deal with the Buffalo Bills which would earn Ryan a salary of $5.5 million per year. 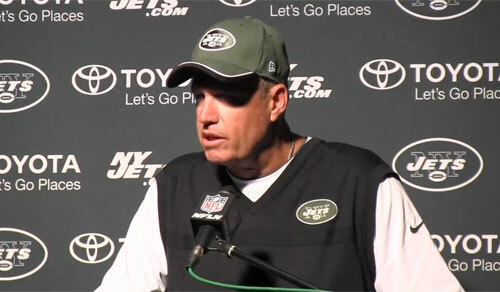 Ryan and general manager John Idzik were fired on Dec. 29 after the Jets went 4-12 and missed the playoffs for the fourth straight season. Ryan is not expected to bring many, if any, of his former Jets offensive assistant coaches to Buffalo. Sources told ESPN that Ryan and the Bills are expected to hire 49ers offensive coordinator Greg Roman to the same position in Buffalo. Ryan and Roman previously worked together as assistant coaches with the Ravens. Ryan will become the first coach to change teams within the same division since Bill Parcells joined the Jets in 1997, according to ESPN Stats & Information. Parcells coached the New England Patriots the previous season. The Bills went 9-7 this past season — finishing with a winning record for the first time since 2004 — but haven’t made the postseason in 15 years, the longest active drought in the NFL. ESPN NFL Insider Adam Caplan contributed to this report. Sports Speakers 360 is a booking agent for pro athletes. If you would like to book Rex Ryan for a speaking engagement, appearance or endorsement, contact Rex Ryan’s booking agent for fees at 1.855.303.5450.